The aim of the game in a warehouse environment is to achieve a risk-free workplace, although completing this particular game is harder than you think. With hazards at every corner, it is extremely difficult to avoid the odd slip, trip or fall. However, you can minimise the potential of severe accidents occurring with the helping hand of some basic measures. This includes a revolutionary addition to the catalogue of useful safety techniques. With the New Year upon us, workplaces will be taking a look at their handbooks with the view of upgrading and changing policies, advertising new roles and expanding their business. They are also making sure they are moving forward with their safety mechanisms as well, with companies across the world jumping on the craze that is modular barriers. Are they necessary though? Yes! Take a look at the reasons below. It is incredibly easy as the working day goes on that your staff’s physical awareness of their surroundings diminishes slightly. This can be all it takes for an accident to occur. It may include failure to hear the reversing sound of a forklift or even the sound of the fire alarm. It is pivotal that your staff are constantly alert as to where they are and where danger might be lurking. With this in mind, the presence of safety barriers can maintain that awareness. The fact that they are in an area where it is more than likely a moving vehicle will be present will allow them to, habitually, check their surroundings. This means they can make sure they are not in the path of any forklifts or loading trucks. Call it a constant comfort blanket, if you will. Either way, safety barriers are a handy tool to have to guarantee your workers aren’t switching off when it comes to physical awareness. The steps necessary for a worker to reduce the risk level should be covered in your company’s Health and Safety Policy. From the correct lifting procedure to the more basic aspects, such as high-vis clothing, all workers should be knowledgeable and clued-up on the protocols in place. After all, it is for their wellbeing! Should you decide to update and modernise your policy, it is pivotal that your workforce is informed as soon as possible. As much as a barrier is used to protect other aspects of your business, as you’ll find out below, it is just as important to your pedestrian staff as well. One of the main advantages of implementing safety barriers in the workplace is to reduce any possible damage towards your vehicular fleet. A lack of protection towards your forklifts, trucks and flatbeds could result in costly damages. Again, aforementioned, it only takes a split second of carelessness from a vehicle operator for an accident to occur and the possibilities are endless. In the unfortunate event of a collision, a safety barrier will dramatically lower the risk of physical injury, expansive damage to the vehicle and anything, or anyone, it may come into contact with. However, if you have a traditional steel barrier, it won’t work as well as you’d like it to. Its core material means that, should a vehicle come into contact with it, the vehicle will succumb to excessive damage. There’s also a risk of injury to the driver. That’s why it is important to review what type of barriers you have, if you have them, and to make sure you have the most efficient model available. The last thing your company needs is disruption for equipment repairs, or even worse, for your staff to visit the hospital! The chain reaction one accident can cause is enough evidence to consider improving your safety measures. Like we’ve mentioned, a vehicle collision can wreak havoc on your fleet, but think of the potential damages and losses if your stock and equipment is tarnished. Not only will you have to cope with having to replace your trucks and forklifts, but there is also the burden of replacing any damaged goods as well. The financial implications of lacklustre warehouse protection can be devastating across the board. You have racking, boxed items, desks, shutters, toilet facilities – just a handful of what you expect to find in a warehouse. All of these are at risk of damage in the event of a collision and can be expensive to repair. Put any potential productivity-limiting nightmares to bed with the installation of a safety barrier, to ensure important areas of your business are safeguarded from harm. The key to a successful, purposeful safety barrier is presence. It isn’t a tool that is meant to blend in with the furniture, it is there to stand out and should make itself visible. That’s why we recommend a bright, vibrant colour – similar to yellow high-vis jackets and hard hats. Visible colours such as these will ensure that at all times, even during the dreary winter months, your barriers are always present and easy to spot. This works in favour of everybody involved within the workplace. The pedestrian workers, the forklift drivers and the Health and Safety manager. Any blemishes or damage to a barrier can be easily spotted and can therefore be repaired more efficiently. It may be that you already have implements such as safety barriers installed. If that’s the case, then good on you! However, you run the risk of living in the dark ages if you are still reliant on using steel and/or concrete barriers. Traditional steel barriers are quickly becoming less efficient to others on the market, with more modular and productive models available. So, is it time for a safety makeover? Don’t worry, upgrading your safety barriers is much simpler than the idea denotes. Should you choose the right model, your business won’t be affected and before you know it you’ll be reaping the benefits of a modular barrier design. Modular barriers aren’t just there to protect your business, they bring a variety of advantages with them too. In the long run, these benefits can prove to be a tidy investment. Polymer Barriers – Why Should We Invest? The presence of a polymer barrier will bring the core purpose that a traditional barrier brings, but with the advantage of minimising damage as a whole. First and foremost, by upgrading, you can remove the possibility of any future barrier repairs. A modular model absorbs the impact of a collision, removing any shock generated towards the source. So you won’t have to fork out on vehicle repairs or replacements either. This will help to bring down the number of Health and Safety reports filed on a yearly basis, in which we seem to be seeing a steady increase in cases where an accident could have been avoided. It’s one thing to experience a freak accident but when it’s avoidable, it can become quite frustrating for a business to endure. For steel and concrete barriers, if you have to replace the barrier itself, you often find you must replace the surrounding floor space too, due to the way it’s installed. This isn’t the case with a modular model! The easy installation and active memory will mean that in the event of a collision, not only is the floor undamaged, but the façade of the barrier won’t change either, allowing it to retain its shape immediately. Yes, the thought of a risk-free working environment sounds glorious but unfortunately it is nothing more than a utopian fantasy. It is frankly nigh-on impossible to create a hazardless warehouse. But you can, however, reduce the possibility of an accident occurring. Using the reasoning above, installing measures such as safety barriers shows the workforce you are keeping their health at the top of your priority list. This creates a more enjoyable and comfortable workplace for everyone, including you as a business owner. Don’t be led into thinking that making a change such as this will take a strain on your business’ finances. The money you could save by not having to carry out repairs and replacements will supersede the cost of installing the barriers in the first place. Need a Hand? Get in Touch! 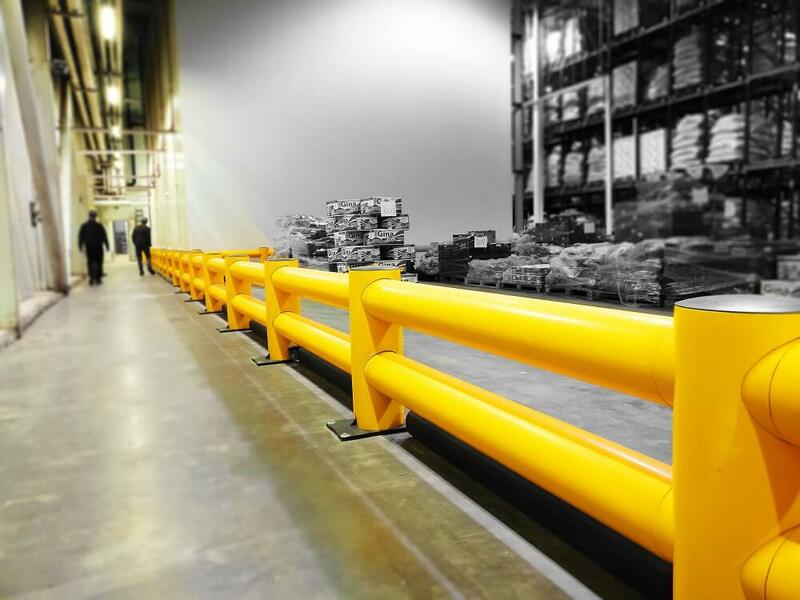 If you have any questions about safety barriers and the benefits they can bring to your business, then you are more than welcome to get in touch with us at Boplan. We have years’ worth of experience in safety measures and can send you in the right direction in terms of what kind of barriers will be the best fit for your company. We’re like you after all, we only want the best for your business and everyone that works within it! Get in contact on 01902 824 280 – one of our team members will be happy to assist with your query. Don’t leave something as important as warehouse safety to chance, protect your business today!